Paddy’s Whiskers play footstompin’ Irish, Scottish and American music in a contemporary and upbeat style. The band provide great barn dances and ceilidhs at festivals, weddings and parties across Devon, Somerset, Cornwall and the South West. Our repertoire includes full power Irish jigs and reels, banjo and fiddle driven American square dancing tunes and a taste of Scotland with haunting and powerful border bagpipes. Our ceilidhs are straightforward, upbeat and fun – bringing all your guests together. By the end of the night everybody has danced with everybody else….fun and a real ice breaker! Whether you are an experienced dancer or a complete beginner, our caller explains all the dances on the night and has an excellent sense of humour – always getting everybody up and dancing. We alternate the dances with well known songs and tunes while people catch their breath. We bring a great quality sweet sounding PA system and lighting for both band and dance floor. We can provide a radio microphone for any speeches, and background music to keep the party going when we are not playing. Dances usually last between two and three hours with a short break somewhere in the middle but all timings are totally flexible to suit you and to fit in with your plans for the night. Paddy’s Whiskers play fiddle, banjo, mandolin, guitar, cajon, and border bagpipes. Different sized line ups are available to suit different venues, events and budgets – from the “big band” four piece band plus caller to a duo (Re-Jig) plus caller. Andrew, from the band is also a DJ, so we can provide a disco or DJ set for after the dance if you want the party to continue later into the night. More information here. Why not visit our special website dedicated to barn dances and ceilidhs in Devon, Cornwall and across the South West? To book Paddy’s Whiskers or Re-Jig to play at a barn dance or ceilidh ring Andrew or Jules on 01803 520798 or email us. 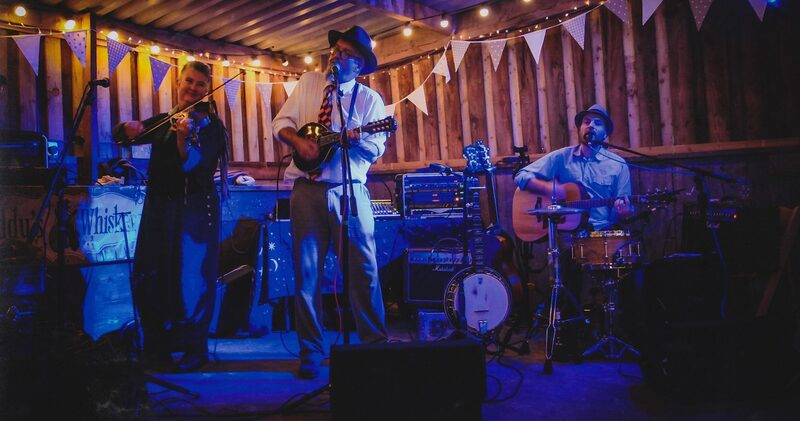 Here’s some video from The Big Barn Dance – a ceilidh that Paddy’s Whiskers played to over 500 people at Occombe Farm, Devon in 2015..
Here’s a recent video clip of us playing a wedding barn dance in Moretonhampstead, Devon…one of the smallest rooms we’ve ever played in, but great fun. Thanks to Richard Scarsbrook for the excellent film work. He can be contacted at richard@scarsbrook.net.